The wedding album spread contains two candid photos taken during a Black Creek Pioneer Village wedding ceremony. 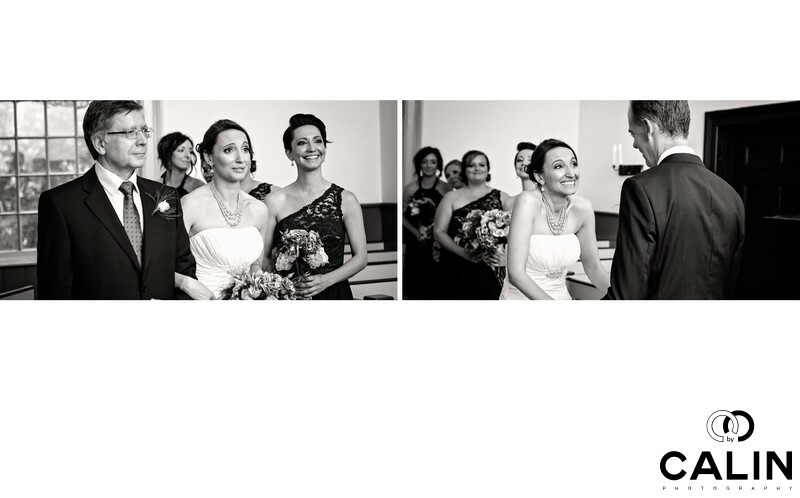 The image on the left, shows an emotional bride looking at her groom. The photo on the right shows the bride and groom holding hands. The bride's expression is priceless. Also, behind the bride, the bridesmaids look at her and seem to have a lot of fun. This is a very emotional wedding album spread created in the Fisherville wedding chapel. In this album spread, we can see a range of emotions displayed by the various characters in the pictures. The father of the bride is clearly proud of her daughter getting married. On the bride's left, the bridal party is enjoying the wedding ceremony. Finally and most importantly, the bride is featuring a wide range of emotions from tears on the last picture to childish joy. The album spread was processed in black and white. For candid wedding photography I always use a black and white processing. Also, I made both pictures the same size to give them equal weight in the story. Shortly after the ceremony we headed to a photo session in the complex. Among the most notable places to take pictures in the village are the gardens, the heritage buildings such as the Town Hall, Dickson's Hill School, the Backsmith shop and Roblin's Mill. The big day continued with the reception at the Grand Pavilion.